The F-16 that crashed near the US-Mexican border belonged to the Iraqi air force, and was flown by Brigadier General Rafid Mohammed Hasan, training with the Arizona Air National Guard. There is no word what caused the crash. Iraqi Ministry of Defense confirmed the general’s identity on Friday, after search-and-rescue teams found his remains. Hasan’s F-16 Fighting Falcon went down Wednesday evening near the city of Douglas, about 120 miles southeast of Tucson. BREAKING: Body of F-16 pilot found in Douglas. Iraq's Defense Ministry confirms Brigadier General Rafid Hassan was the only person on board. The crash happened near a major gas line and caused a rupture, according to Cochise County officials. At least one home was reported to have been evacuated due to a rapidly spreading fire. Heavy storms further hampered rescue efforts. Iraq’s embassy in the US issued a statement Friday saying it “deeply mourns” the death of Hasan. “Brigadier General Hasan's dedication to serving his country will continue to be honored and remembered among our nation. May Allah rest his soul in peace and give his family and loved ones strength and comfort during this difficult time,” the embassy statement said. Arizona officials initially declined to release the pilot’s name, saying only that he was one of over 40 students taking part in a training program in Tucson. According to AP, Hassan has been training in the US for four years. Initial reports identified the aircraft as belonging to the 162nd Wing of the Arizona Air National Guard, based out of the nearby Davis-Monthan Air Force Base. The 162nd also conducts international training for F-16 pilots from the Tucson International Airport, according to its website. Reuters reports pilots from nine countries, including Iraq, are among the trainees. 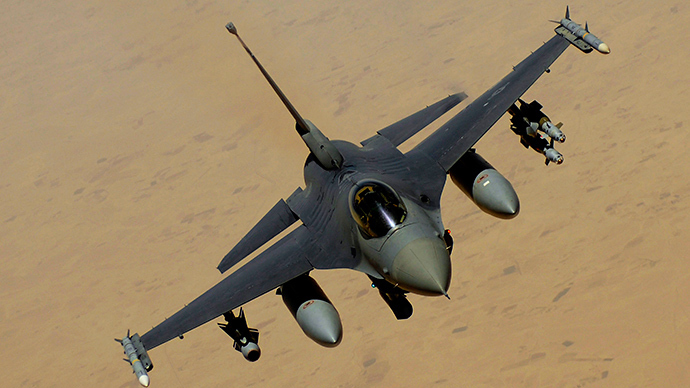 Since 2011, Iraq has purchased 36 F-16 jets for $3.86 billion. Half of the jets were held back in Tucson over concerns that they might fall into the hands of Islamic State militants, who have made rapid advances in Iraq since June 2014. Thirty Iraqi pilots have been training with the 162nd since then, reported the Tucson NBC affiliate KVOA, and the first group was scheduled to begin flying combat missions against Islamic State next month. Designed in the 1970s by General Dynamics (now Lockheed Martin), the F-16 was originally an air superiority fighter, but has since been adapted for ground-attack missions. It is no longer being bought by the US Air Force, but continues to be exported to US allies. In January of this year, a Greek F-16D crashed into the flight line during NATO exercises in Albacete, Spain, killing both crew members and nine French soldiers. Five French and Italian aircraft were damaged or destroyed on the ground.